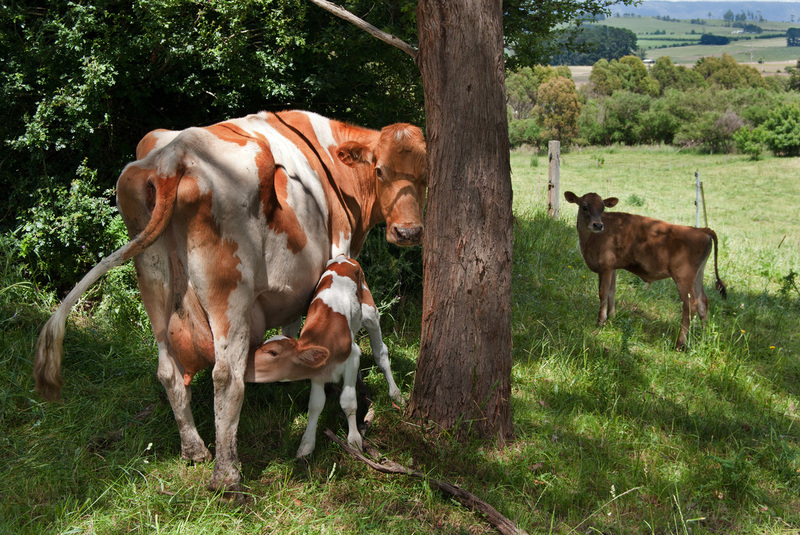 Elgaar Farm is one of Australia’s leading organic, ethical, multi-generational dairy farms with more than 25 years of production behind them. Their farming origins and practices date back hundreds of years to their Bavarian roots. ﻿Thanks to Elgaar's amazing crowdfunding supporters they now have a brand new AS 3993 pasteuriser to meet the new requirements placed on them. They're back in production and are attending Farmer's Markets in Devonport, Launceston and Hobart every weekend, rain, hail or shine. Stay up to date by signing up to their email list, and following Elgaar on facebook (Friends of Elgaar Farm) and Instagram (@elgaarfarm). Let us take you on a journey that is all but lost in our fast-paced industrial farming system that has little time for people like the Gretschmann Family and farms like Elgaar. It all begins in the Alpine foot hills in Bavaria some 600 years ago. Joe Gretschmann’s ancestors began dairy farming way back then and continued on the same land until Joe came along. As a young man he met a beautiful and clever Ag-science student, Antonia. Together they continued dairy farming, had 6 children and lived happily ever after.....well not quite. In Bavaria during the 70’s, chemical farming was taking hold and Joe followed other farmers and adopted chemicals into their practices. The thinking was, as long as it makes the grass grow faster, the weeds die quicker and the cows produce more milk, then it must be good. That all changed when their first child came along. They began to ask some questions. “Is this really a world we want our children to grow up in?” The answer was no and from that day on they started to farm organically. Not satisfied with old models of organic farming Joe and Antonia dived head first into finding out how to farm without chemicals in a modern way. They read books, talked to other growers and agricultural researchers, experimented, and after much trial and error they found a farming and production system that suited them both to a T.
1. To provide an environment that is beautiful for us to work in as well as close to the cows’ ancestors’ natural habitat (Aurochs). 2. To allow the cows to live in a way that is true to their nature. 3. 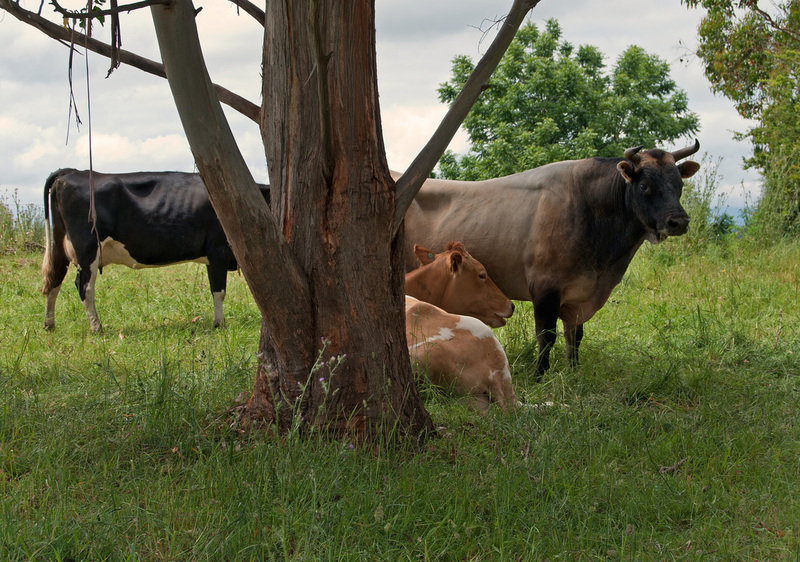 To produce as much of the cows fodder requirements as possible using our available land. 4. To grow grain for human consumption and use the excess for supplementary feed – no waste. 5. To base the diet of the cow on its natural digestive system. 6. To use the natural efficiency that comes from the interaction of animals and plants. 7. To farm in a way that fits with the way we want to live and supports future generations to do the same. 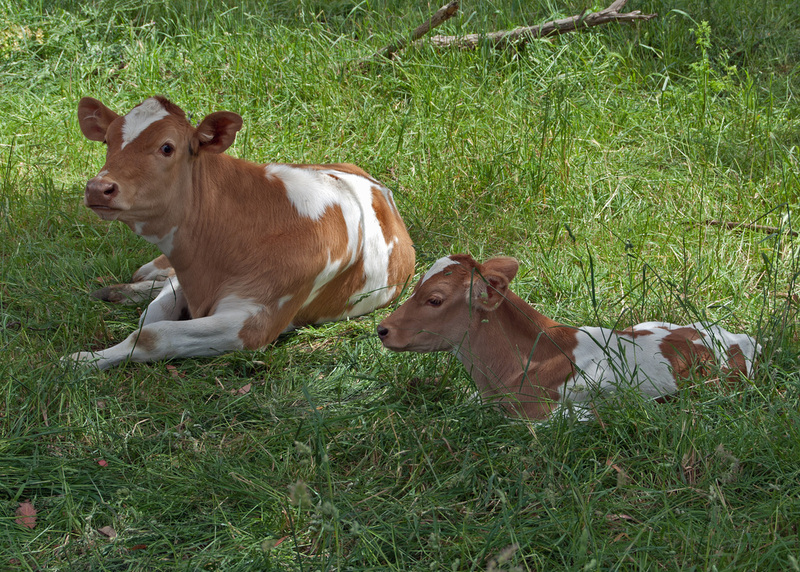 Caveman, our quintessential Jersey bull, is relaxing in the meadow with the cows. We believe to have healthy people and animals you must have a good environment to live and work in. That’s why we’ve shaped our farm to imitate the cow’s natural environment (the edges of forests) where they live off a mixed diet of many grasses and herbs. We planted thousands of trees, we let our grasses grow taller and every meadow has a wide variety of legumes, herbs and grasses. We believe that working with our cows in a caring, humane way is the only way to go. We let the calves run with their mums, we leave their tails on, we let the old cows retire on the farm, we give our cows a longer break between calving, we feed only small amounts of grain and we let the bulls run with the cows. We aim to grow all the feed we need for our herd right here on the farm as well as grain for human consumption. We achieve this by what is called a ‘double cropping system’. Simply put, we grow crops in winter that do well in winter and grow crops in summer that do well in summer. For example, we have a mix of annual grasses and legumes growing in winter that grow better than a perennial. After they’re cut for hay or silage in spring we plant a grain or maize crop in the same spot that will be harvested in autumn. After seven years we sow it to down to a grass and red clover mix for a few years and then we start again. There is a whole list of reasons why we choose to use this system; efficiency is gained not by industrial scale but by the interaction of livestock and cropping systems, we can grow more fodder than a perennial pasture and we even have large amounts of quality grain for stock and human consumption; we don’t need to buy in grain grown intensively and shipped long distances; we use a fraction of the water used to keep grass green during summer (40mm to 160mm compared to 800mm over growing season); and it can all be done with a twice yearly application of thinly spread manure donated by our lovely cows. But of course it is a lot of work at certain times, we need machinery to run well and use diesel and if it is not planted in time it can be stressful. We think it’s worth it! 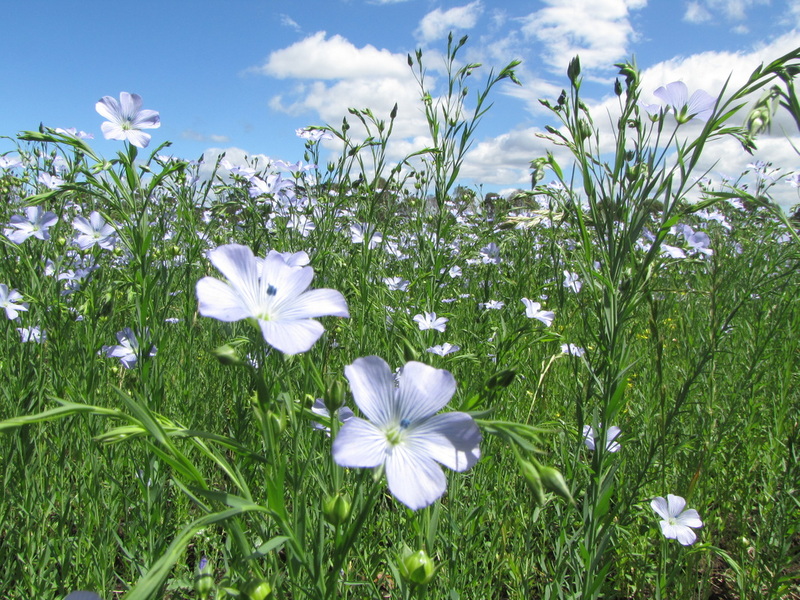 A crop of linseed in full bloom. 1. To be produced in a beautiful traditional building. 2. To create a product that is as authentic and natural as possible. 3. For all products to contain the highest possible health benefits. 4. For our products to taste absolutely delicious. 5. To be produced in a manner that puts a high priority on food safety. 6. To be produced in accordance with time-honoured cheese-making and dairy processing skills. 7. To use the minimum amount of resources in the production process. 8. To be in direct contact with people who consume our products. · We produce and package all our dairy products in a beautiful heritage building made in the traditional Bavarian style out of natural materials such as timber, rock and bricks with lime-wash walls. Sunlight streams in through the large windows onto meticulously maintained and cared for equipment, much of which we brought over from Bavaria. 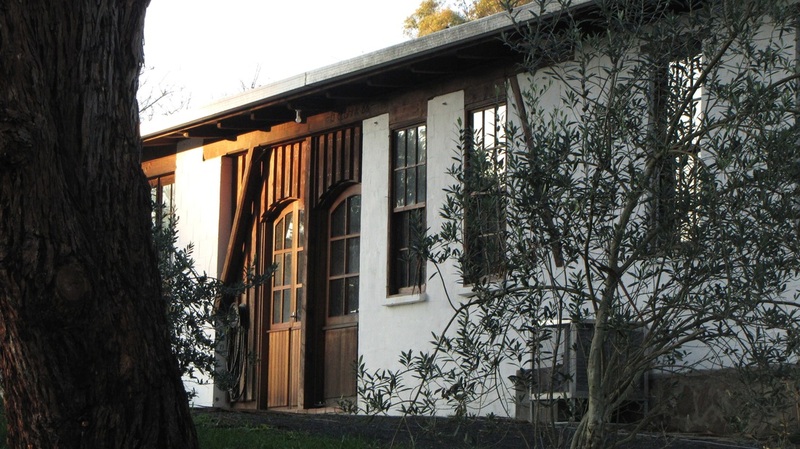 This building is perfect for making dairy products and is the reason why many similar factories still operate in Europe. The Elgaar cheesery, built in the traditional European style. 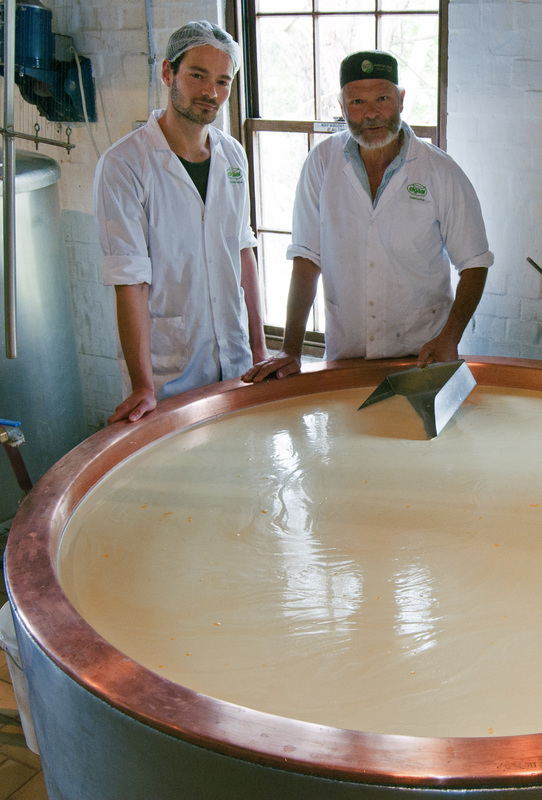 Freshly made cheese ready to go into the underground cellar for maturing. 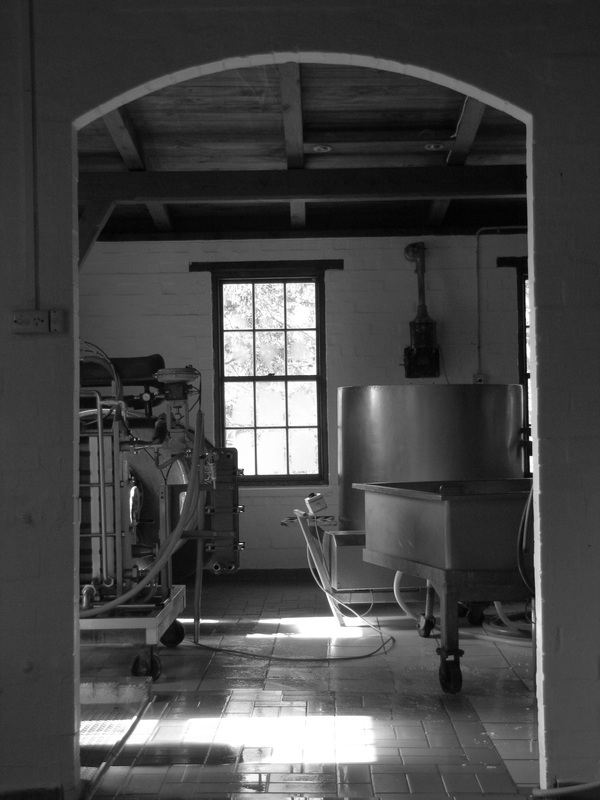 Sunlight streams in through the large windows onto meticulously maintained and cared for equipment. 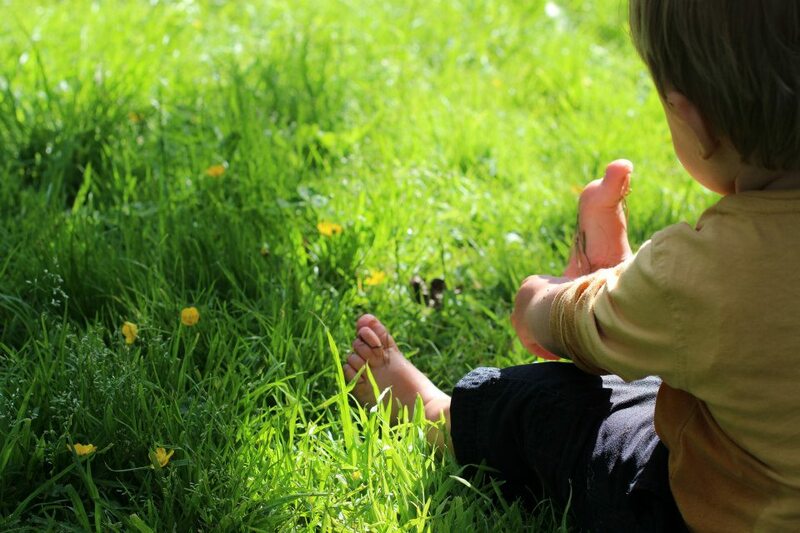 · We use only natural ingredients in our products. No thickeners, no milk powder, no gums. · We produce all our products using the same natural culture developed here on the farm which has much higher beneficial bacteria than commercial varieties. This was common practice everywhere until commercial breeding of bacteria and mould spores for cheese making became common place. 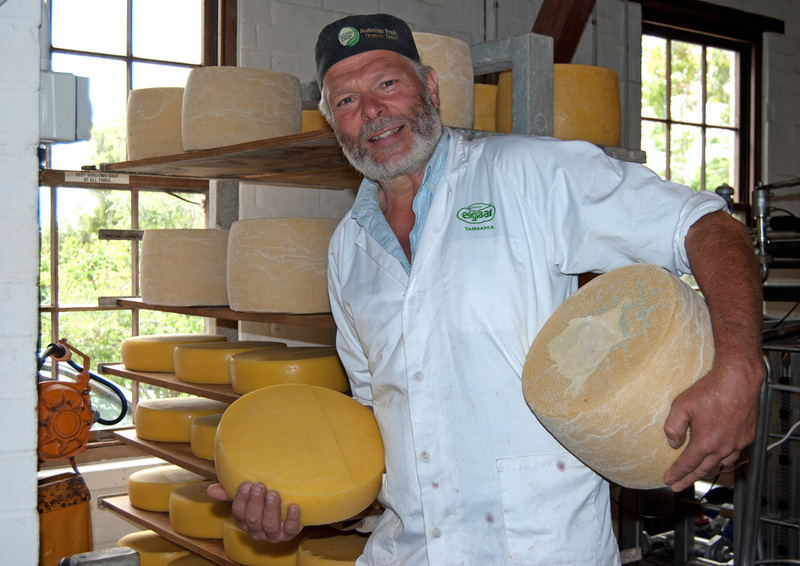 Joe with son Alex Gretschmann, Elgaar Farm's chief cheesemakers. · Being family run and small scale means we are able to oversee every step in the production processes and know our product inside out – as demonstrated by our zero contamination record for our entire production history – over 20 years. While we think a good quality assurance program is essential, they are largely designed with larger factories in mind where every step is overseen by a different person or machine. 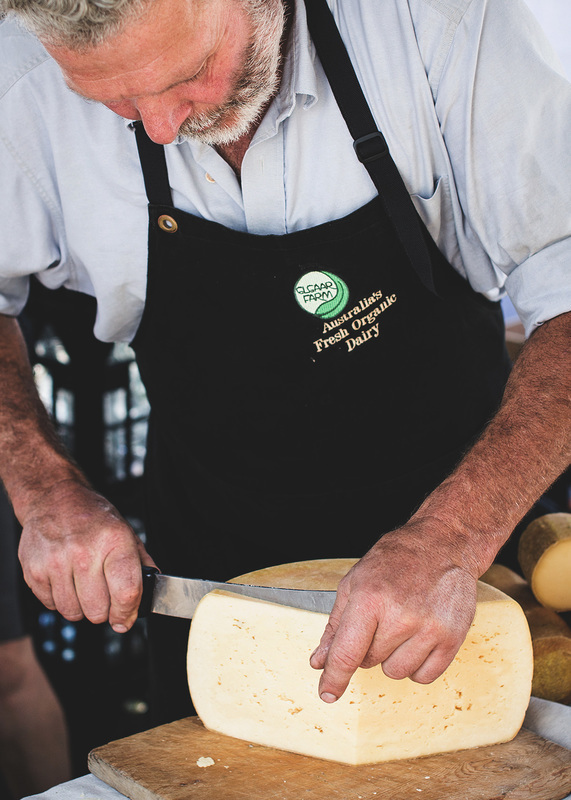 Joe knows his cheeses from milking the cows all the way through to cutting it for customers at farmers' markets, and every step in between. · We use hand- made wooden crates to distribute our products. · We use only glass bottles and jars for all our products. We ask our customers to return the glass jars and bottles so we can scrub, sterilise and refill them. In a single year of production this amounted to 14 semis full of rubbish not ending up on the tip face. Elgaar's award winning milk, yoghurt and creams are packaged in returnable glass bottles, like in the good old days. · We prefer not to use copious amounts of harmful chemicals like iodine often found in milk as residues. Instead we keep equipment clean by hot water and caustic soda. 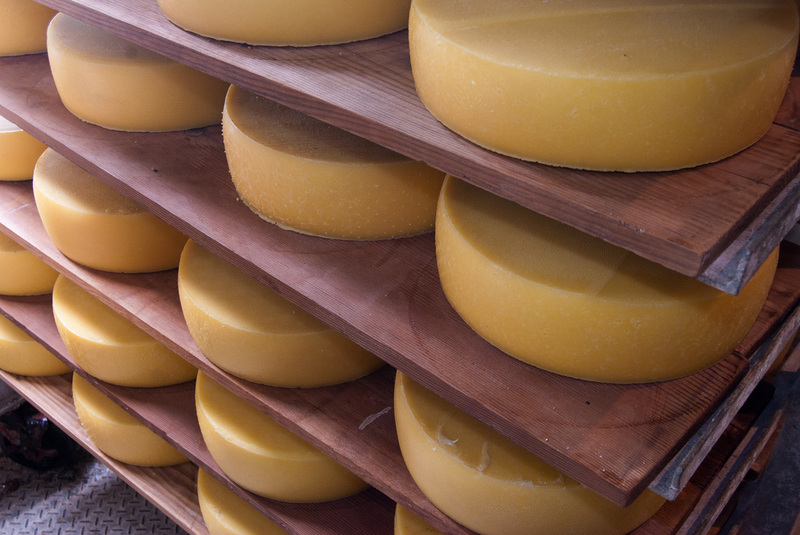 Right now in Tasmania and Australia we are at risk of losing these time-honoured production techniques while allowing the import of cheeses made in the same way! We’re being told to produce products that arrive in a plastic crate; are packaged in non-returnable plastic; are produced in a ‘sandwich panel’ building with no wood in sight, are produced from commercially available cultures so it tastes the same as every other dairy product around and are likely to contain chemical, antibiotic and hormone residues. We do not want to do this, ever. Elgaar is about saving regenerative farming practices and heritage food traditions, largely lost in our modern food system. Elgaar isn’t just any farm, it’s a way of life which we believe our world needs more than ever. We wouldn't be here anymore if it wasn't for the amazing support we have from all our wonderful crowdfunding contributors. We are forever grateful.